Heavy Vehicle Use Tax [HVUT] Form 2290, tax period starts July 1st. Hope you are aware that IRS has mandated e-filing for taxpayers with 25 or more vehicles with registered gross weight of 55,000 lbs or more. We have simplified e-filing process and provide Tax Professionals an easy-to-use application to serve their clients/customers. It offers a special discounted pricing for Tax Professionals like you. There are many unique features to serve you better. We are Certified & Authorized by the IRS as an E-File service Provider for Excise Tax Forms. Our online software application gives you the option to e-file and transmits Excise Tax Forms [Form 720, Form 2290 and Form 8849] directly to the IRS electronically. Our product has all of the features needed to complete Excise Tax Forms in a quick and accurate manner. We provide support that you can count on and security that you can trust. Just register once and you can manage all your clients using the same account. We offer special discounted pricing for tax professional and other industry service providers. We also offer special seasonal package, which can save you up to 90% off other E-File providers. The seasonal pricing depends on the number of clients you have. You can pay upfront for the expected number of clients and file unlimited returns for the clients. Your rate per client is as low as $17.00. Act now and take advantage of the offer. As your client base grows, you can always make changes as needed. Our system allows you to add an unlimited number of businesses and EIN numbers to a single registered account. Access all of your clients and vehicles in one place while still keeping them organized by EIN. When you file for bulk vehicles in your client’s fleet, you can simply upload an Excel file containing the vehicle information directly into your account. The bulk upload works for taxable vehicles, suspended vehicles and credit vehicles (Sold/stolen/destroyed and low mileage). Also, all the data in our application can be exported / imported to manage your clients. We don’t restrict with any vehicle limit. You can add even more than 50,000 vehicles. You have the privilege of creating multiple user access to share with your team. In this case you act as a admin and can share restricted access to users. You can subscribe for TEXT alert, when your clients return got accepted/rejected by the IRS you will be instantly notify by a TEXT alert on the status of the return. Receive updates on the move. We do not charge transaction fee like other providers, you will be paying what you see in the pricing chart. No hidden charges by any means. Already registered simply click “Start here” to continue with your filing, Yet to register, feel free do not hesitate to talk to our Support Center at 1-866-245-3918 or simply email to support@taxexcise.com. 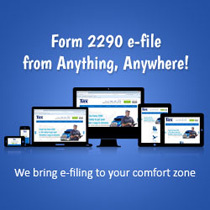 We are happy to support you in making your filing experience hassle free.